Over the past few months, General Motors has teased the 2014 Chevrolet Silverado in company-issued spy shots and testing videos showing the new truck heavily camouflaged. Those masked shots of the new Silverado led many to believe that the 2014 Chevy half ton pickup would look a great deal like the current models and now that the new truck has been unveiled – those people were right. The 2014 Chevrolet Silverado is shaped very similarly to the current trucks at your local dealership with very square styling all around. The front end is still very upright with the “stacked” grille and headlights but both of those features have been enlarged, taking up almost the entire front plane of the truck and providing a bolder look than the current models. From the bottom of the hood to the top of the front bumper, the grille fills the entire central area with headlight housings that are every bit as big on each side – with HID projection headlights coming on the high end 2014 Silverado LTZ. Above this bolder new front end is a massive hood with dual “humps” running back to the cowl – giving the truck a more muscular look while also improving aerodynamics and decreasing wind noise by funneling air over the windshield wipers. The front bumper is also new yet familiar, with a larger single opening as opposed to the trio of smaller openings on the current Silverado. Along the side, the 2014 Chevrolet Silverado has a similar design to the outgoing models with the flat side panels punctuated by big, bold wheel flares that are far sharper than the 2013 trucks. The inner edge of the wheel flares have a far more square design and shy of the windshield angle, this new Silverado has a very upright, boxy design. However, I should point out that while “boxy” is often used as a slight – the 2014 Chevrolet Silverado wears this angular form very well. Out back, the 2014 Silverado is, again, similar to the current models with rectangular taillight lenses except the new models wear slightly more angular lenses with new integrated steps in both corners of the rear bumper to aid getting in and out of the bed. The changes made to the front end of the 2014 GMS Sierra are more elaborate where the stacked headlights have been removed to make room for a new single projection lighting system flanked above and below by a row of bright LEDs. Like the Silverado, the Sierra gets a bigger, bolder grille that sports a similar style to the current models along with a refined front bumper with larger bezels around the fog lights and around the tow hooks. The sidelines of the 2014 Sierra look very similar to the new Silverado and the back end seems to follow that trend as well with the exception of badging. The interior is where the 2014 Chevrolet Silverado and GMC Sierra should really differentiate themselves from the trucks on dealership lots right now and truth be told – that was where GM trucks needed the most improvement in my humble opinion. GM has promised that the new cabin is quieter than outgoing models but as you can see in the images on the right – the 2014 Silverado and Sierra are packed full of new technology. This begins with the redesigned gauge cluster that has a six gauge layout featuring two large gauges on the outer edges with four small gauges and a 4.2” driver information screen mounted in the middle. The sporty new steering wheel has controls for the infotainment system mounted on the upper spokes while the big, bold center dash section is enclosed on a “pod” design, housing the heating controls and the touchscreen that controls the sound system, the nav system, Bluetooth phone system and the vehicle settings. That center pod design is copied on the outer edges of the upright dash with the driver’s side pod containing an HVAC vent, the four wheel drive control knob, the light controls and the integrated trailer braking system controls. The passenger side pod is reserved for just the HVAC vents with the huge over-under glove box being located right next to the vents. 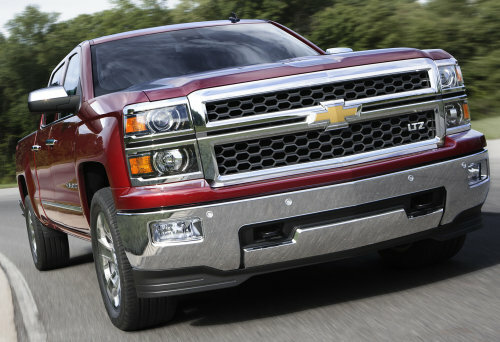 The 2014 Chevrolet Silverado and 2014 GMC Sierra will be offered with three new engine options with two of them being the same size as current offerings and a third, bigger engine option. No real specifications have been announced for these engines but we know that they are all based on the new General Motors family of small block engines – the same engine family that introduced the new 2014 Corvette LT1 engine. The entry level engine for the 2014 Chevrolet Silverado and GMC Sierra is an all new V6 measuring 4.3L, which is the same size as the current entry V6 but the company explains that this is a new engine designed specifically for truck duty. The next engine in line is a new 5.3L V8 that GM expects to be their highest volume engine and the top of the line mill is a new 6.2L V8 – all of which GM expects to offer vastly more power than the current engine lineup while also offering better fuel economy than the trucks available at Chevy and GMC dealerships right now. All of these new engines will be mated to na 6-speed automatic transmission but rumors suggest that there will be an 8-speed auto coming in the near future. Click any of the thumbnails above on the right for a closer look at the 2014 Chevrolet Silverado and the 2014 GMC Sierra and stay tuned to TorqueNews.com for more news on the next generation GM pickups as it becomes available! I was disappointed that they did not announce a turbocharger nor a diesel engine. Several other cars are offering one or both of these. It seems that that would also be the next logical choice to improve MPG and torque while improving the air quality.